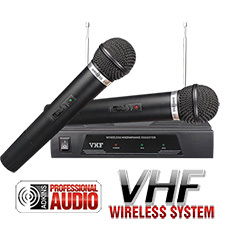 The Adkins Pro Audio VHF-Dual Wireless Microphone is the perfect entry level professional wireless mic, and delivers clear, transparent audio for a variety of singing and speech applications. Offered at a breakthrough new low price for a professional wireless. This system is loaded with features. All the advantages and freedom of 2 channels of wireless operation without cumbersome cords. Easy to use - simply plug in instead of your wired microphones. Use both channels with single receiver and two handheld microphone transmitters for simultaneous dual operation. Excellent high fidelity audio - perfect for public speaking, karaoke/recreational singers, DJ's, and many other applications. VHF (170-216MHz) operation for reliable, interference-free performance 150+ feet typical operating range - up to 300+ feet line-of-sight Receiver: Easy to use -simply plug into your audio mixer or amplifier instead of your wired microphone. Operate either channel (1, 2) singly or both simultaneously. High-band VHF (170-216 MHz) operation for interference-free performance. Advanced audio processing circuitry for a wide dynamic range (no overloading for loud inputs or background hiss during quiet use. Complete controls and connections for professional operation include front panel power ON/OFF switch, CH 1 and CH 2 output volume controls, Power ON LED, CH 1 and CH 2 transmitter on LED indicators. Back panel 1/4" audio output jack and DC power input jack for supplied AC/DC adaptor. Dual retractable CH 1 and CH 2 antennas. Special added circuitry eliminates transmitter on/off "pop" noise. Handheld Microphone Transmitters: Each transmitter operates on a separate single frequency in the VHF 170-216MHz band and can be used singly or together simultaneously with the VHF-DUAL dual receiver.